Whether you want to learn to ride a bike, or give your skills a brush-up, our instructors can help you gain the confidence to ride happily, safely, and comfortably on the roads. We teach adults and children urban cycling skills on a one-to-one basis; from complete beginners to those who would like to brush up their skills and master urban cycling. The Bikeability accredited training that we offer has three levels, and everyone completes each level in order to progress onto the next. This could be a 20 minute assessment of your current skill level, or it could mean a couple of sessions getting to grips with foundational cycling skills. 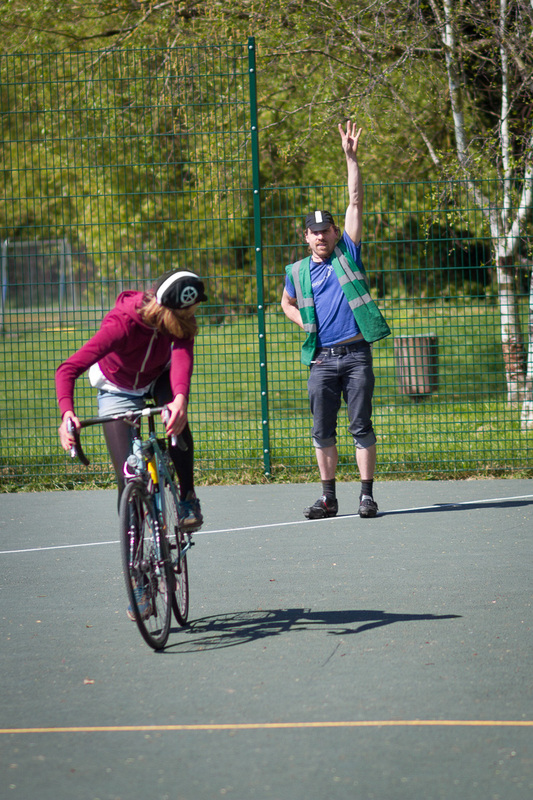 Level 1a – Taught at an off-the-road location, you will learn how to steer and balance on a bicycle. Level 1b – Still taught off the road, you will learn the skills to control and master the bicycle, ready to move on to level 2. Level 2 – You will get out on the roads! Level 2 gives you a real cycling experience so that you are able to deal with quiet roads and/or short journeys. Level 3 – You will learn the skills to tackle a wider variety of traffic conditions. When you reach level 3 standard you will be able to deal with all types of road conditions and more challenging traffic situations. All three levels can be taught in a few 2-hour sessions spread over a few weeks. Do you offer cycle training for children/teenagers? Yes we do! We can teach up to two children at a time. Please use the same booking system and indicate on the booking form that the lesson is for a child/children. Lessons can be shortened from our standard two hours to a minimum of one hour to allow for younger people’s levels of energy/attention. From what age can my child do cycle training? If you think your child is ready to learn to cycle, then no age is too young! Do you offer cycle training for Disabled People? Yes we do! Book a session using the same booking system and add any details you think it’s important that we’re aware of in the “Other information” question. We support inclusive cycling, and we work with Wheels For All to support introductory inclusive cycling sessions at Horspath Race Track. Cycling can be a liberating way for Disabled People to get around. Adult cycle training is currently taught on a one-to-one basis. We can teach children on a one-to-one or two-to-one basis. Children (under the age of 18) will need to be accompanied by a parent or guardian. If you want to arrange a group session please get in touch as they require more organisation. How much does cycle training cost? The current rate is £40 per hour of tuition. You can pay by cash, cheque, or online when you book. Currently there is subsidised training available to members of the University of Oxford, or for employees of Oxford Health NHS Trust or Climate Outreach. The booking system will ask you to indicate who is going to pay for your lesson and to provide ID. When are the cycle training sessions available? The schedule is here and is updated on a monthly basis. All available sessions are listed in this schedule. We are currently working on increasing availability to weekends and evenings and will announce changes in our newsletter. You can sign up for the newsletter here. Your first lesson needs to begin at one of several off-road traffic-free locations around Oxford shown on the map below; this will allow us to assess your current skill level before going on the road. Choose your preferred starting location and fill this in on the booking form. Once your instructor is happy with your skill level you’ll be able to move to on-road cycle training, focusing on specific areas/roads in Oxford (or potentially surrounding villages depending on negotiation with the cycling instructor) you may find most challenging. Can I borrow a bike from you for the session? If you are learning how to balance on a bike (level 1A), then yes – for the lesson. When booking, please indicate this on the online booking form and state your height so that we can bring the right size bike for you. If you can already balance, we are unable to provide a bike for the lesson; it is best if you develop your skills and practice on your own bike anyway! Unfortunately we don’t have any children’s bikes available at the moment. I heard that my organisation will pay for my cycle training – is that true? It could be true – members of the University of Oxford (staff & students) can each receive up to six hours (that’s 3 full sessions) of cycle training paid for by the University. Employees of Climate Outreach can also each receive up to six hours of cycle training paid for by their employer. We also have an agreement with Oxford Health NHS Trust whereby any of their employees can receive an hour of cycle training paid for by the Trust. If you belong to any of these organisations, please select the relevant ticket in the booking system. Is subsidised or free cycle training available? Occasionally we have access to funding that allows us to offer cycle training sessions for free, or for reduced cost to the trainee. We don’t have any such funding at the moment though. If you’re aware of any relevant grant opportunities which you think we could apply for or if you want to provide cycle training to your employees, please let us know! Great! How do I book a lesson? Please visit this page to see the schedule and book a session. If you haven’t booked a lesson with us before, please only book one session for your first lesson – you’ll be able to arrange follow-up sessions with your instructor afterwards. How do I cancel my cycle training session? There is information about how to cancel your session in the booking confirmation you were emailed. You can also see how to cancel here and view our refund policy. Are you the only providers of cycle training in Oxford? We are the only Bikeability accredited provider of cycle training in Oxford. There are other Bikeability accredited cycle training providers working in Oxfordshire. If you’re based near Witney, the super Windrush Bike Project also provides cycle training. If you’re based in Bicester CycleLyn also provides cycle training. You can find out more information about other Bikeability accredited cycle trainers here on the Bikeability website. Hey! I couldn't find an answer to my question above. How do I contact you guys? Please use the form below to submit your enquiry. Thanks!